Big cats were active in plain view of residents in the Santa Cruz Mountains overnight Tuesday. 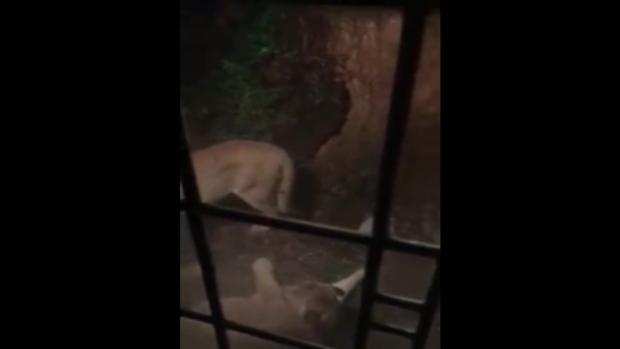 In Boulder Creek, resident Ben Slaughter woke up in the middle of the night, his dogs barking, and found two cougars just outside his bedroom window. 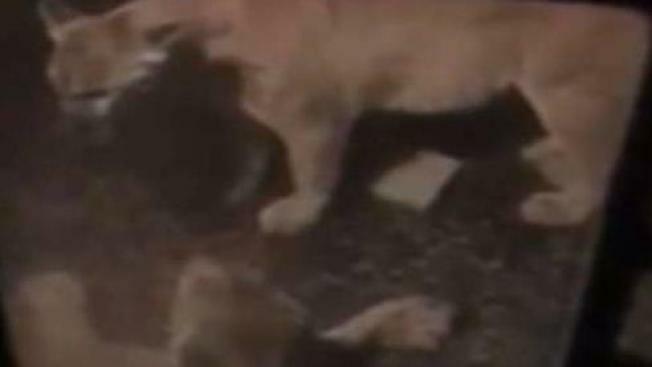 One of the lions was circling the other, which was lying on the ground. Slaughter caught it all on his phone's camera. Cougars are solitary animals and very territorial, but these two lions were sparking up a romance, according to experts in a report by KSBW. "It was a once in a lifetime experience," Slaughter, a firefighter, told the television station. "It was crazy because they didn't even notice us really, they were so enveloped in themselves." In unincorporated San Mateo County, an aggressive mountain lion was spotted early Tuesday morning. The animal, seen in the 5000 block of Pescadero Creek Road at about 4:30 a.m., has killed many small livestock animals in a resident's backyard, according to county officials. Leona Cash said she finally scared it off herself. "He didn't run off until I screamed as loud as I could," she said. "I don't even know what way he went because I was so scared." Cash said she later found feathers and believes the big cat ate six of her chickens. On Tuesday night, she locked her remaining chickens in their cage and was worried about her horse. "They might be coming back tonight because they know there's food here," Cash said. San Mateo County sheriff's deputies issued a warning Tuesday suggesting people lock up their small animals. Always keep children and pets in sight while hiking and within arm's reach in areas that can conceal a lion. If a mountain lion attacks a person, call 911.